The outstanding individuals from this weekend’s African World Cup qualifiers. In tough away games all it can take is a jittery goalkeeper for your defence to unfold. Deputising for the injured first-choice Sylvain Gbohouo, Sangare looked assured when called upon and made some vital saves. The ASEC Mimosas goalkeeper has been on the international scene for seven years and he proved in Marrakech that he is an able understudy. Tireless performance where he respected his defensive and attacking duties – the exact reason coach Micho Sredojevic recalled him in September after a two-year absence. When the Uganda defence went AWOL in the first half on Saturday his last-ditch tackle, after racing from the right to the centre of defence in recovery, prevented a certain goal. His best performance in an Ivorian shirt in a game where he had to raise his standard following the absence of Eric Bailly to injury. He was characteristically commanding in the air, and some impressive byline interceptions in the second half made a young Moroccan forward line realise it just wasn’t their day. A silky, swaggering centre back of yesteryear, Hector Cuper’s pragmatic system suits him down to a tee as it allows him to do what he does best: reading the game and stepping up from defence to instigate counter-attacks. This was evident against Ghana where he read the game well, frustrating an attack that, despite the team’s poor form, isn’t short of quality. A right-back but he deserves his position in this team of the round for an excellent performance against Ghana. A survivor of Egypt’s golden era, the former Hull City defender stifled Ghana down his wing in what was a very solid performance. His willingness to defend and belief in Cuper’s pragmatic methods, as expressed after the game, surely sends out the right message to his less experienced team-mates. One of the rare times Algeria were able to bypass him in midfield saw Nabil Bentaleb scored his thunderbolt. His intensity, speed and passing was crucial to blowing Algeria apart in the first half. His defensive work to shield the nervous Kenneth Omeruo, playing at right-back on the day, was also invaluable. Faded in the second half and his team faded with him as Algerian knocked on the door. His first half, however, was a masterclass. Poised, elegant and canny with his brawn, it was as good a half as you will see from a player, particularly a captain, in a game of high magnitude. For much of the time it seems he’s more famous for his nickname than his ability on the pitch, but he proved the doubters wrong on Sunday evening. The consensus was that this was his best performance at international level, with his pace providing a regular outlet and winning the penalty just before half time. He continued his resuscitation since the summer with another sparkling performance, taking the game to Algeria whereas his colleagues in attack, Iwobi and Iheanacho, had relatively quiet games. A brace to his name shows his currency, and he can consider himself unfortunate not to have scored a hat trick. On the losing side but it doesn’t stop his summation to this XI. Nigeria may have won 3-1 but they endured a nervous second half, and much of that was because of the ball-holding and dexterity of Brahimi. The sheer task of containing him, even when he’s out of form, is more than a workout for a defence. Early signs suggest that Burkina Faso may have just found their most reliable striker since the legendary Moumouni Dagano. 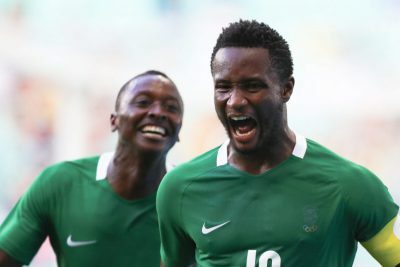 After his last gasp goal to send Burkina Faso to AFCON 2017, as well as the equaliser against South Africa, an assist and a goal continue Diawara’s burgeoning international reputation.